Who won the first-ever Donald Ross Memorial Invitational boys individual title? Tiger Woods walks toward a press conference during last week's PGA Tour's AT&T National, which is tied to his charity foundation. Photo courtesy of McClatchy-Tribune News Service. Tiger Woods announced on his web site that he will not play in this year's British Open, slated for July 14-17 at Royal St. George's Golf Club. The former No. 1 player in the world hasn't teed it up competitively since the Players Championship, dubbed as the fifth major by many, earlier this year. Woods withdrew from that tournament due to a left leg injury. He also missed the recently completed United States Open, where Rory McIlroy crushed the tournament's scoring record for his maiden major triumph. 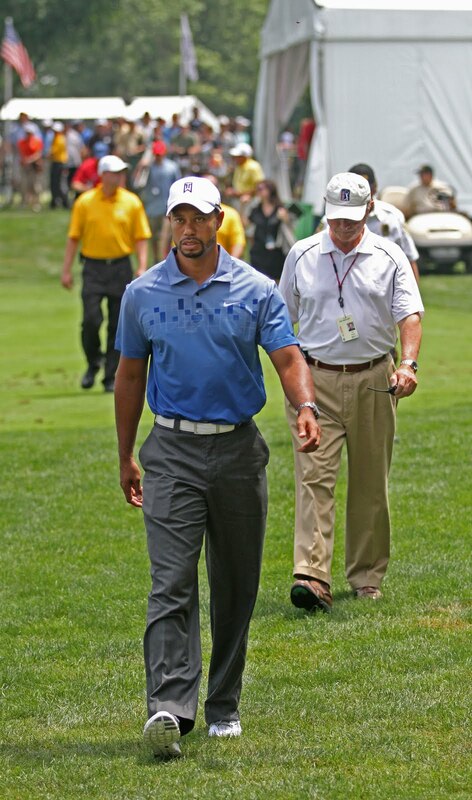 "Unfortunately, I've been advised that I should not play in the British Open," Woods said. "As I stated at the AT&T National, I am only going to come back when I'm 100 percent ready. I do not want to risk further injury. That's different for me, but I'm being smarter this time. I'm very disappointed and want to express my regrets to the British Open fans." Florida is known as the golf capital of America. The Golf Coast examines what's going on in the local golf scene. We'll also offer instructional videos, advice and our thoughts on both local and national golf buzz. The author, Jason Dill, has been golfing for the past 15 years and maintains a 6 handicap. He has been covering area sports for the past five years and currently covers golf and other community sports for the Bradenton Herald.